What Can Lower Eyelid Surgery Do for Me? /What Can Lower Eyelid Surgery Do for Me? Over time, signs of aging such as lines, crepey skin, noticeable “bags,” and dark undereye circles can manifest in the lower eyelids. Most often caused by genetics and environmental elements, these aesthetic concerns tend to make people appear as though they are chronically tired and/or worn out despite how they actually feel. Fortunately, a procedure known as lower eyelid surgery can often be an excellent option for men and women interested in minimizing these aging symptoms in the lower lids. Medically referred to as lower blepharoplasty, this facial rejuvenation method is designed to get rid of loose, excess skin and protruding fat while tightening the remaining skin for an ideal overall aesthetic. Following treatment, there should be a natural blend between the lower eyelids and tops of the cheeks, and any fat pockets, bags, or dark circles below the eyes should be significantly reduced—if not eliminated. If you are considering lower eyelid surgery, it’s critical that you seek the expertise of a board-certified plastic surgeon who has considerable experience and proven results in all forms of blepharoplasty. 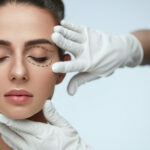 After a complete assessment of your needs and desires, he or she can identify whether lower blepharoplasty, upper blepharoplasty, or a combination of both techniques would be most beneficial for your unique goals.